Having been a fan of the chef Gordon Ramsay for some time now, I was very interested to read his autobiography – Humble Pie. I wasn’t disappointed as I found it a very honest and at times poignant book. It’s interesting with celebrities that, by seeing them on television, you think you know them. I most associated Gordon Ramsay with his television work, and through reading the book, discovered that there was a lot more to know about him than I realised! The book starts with his looking back on his childhood days – a truly difficult time with a brutal father, no money and a transient lifestyle. He and his family moved around so often that he states that he has actually lost count of the number of places they lived in. He openly talks about the impact this had on him – always being the poor boy starting the new school. He is also very open when talking about the painful and difficult relationship that he – and the rest of the family – had with his father. None of them were able to please him and they witnessed a very turbulent marriage between their parents. When you consider the difficult start he had in life, you can only admire the success he has made of his life, through sheer determination and hard work! This is very evident as he talks about the jobs he took and the long hours he worked at some of the best restaurants in Europe, learning his trade from the finest chefs. I hadn’t realised quite how successful Gordon Ramsay is in terms of the restaurants he has opened and the Michelin stars he has achieved. But still, as he explains in his book, he is driven to strive for more and more success. Although of course it could have been very different had he not, as a teenager, suffered from injuries that prevented him from being successful in his first career as a professional footballer! There are a number of chapters in the book covering his dad, football, getting started and working in France. There is also an interesting interlude in his life, when totally exhausted, he took a bit of a sabbatical and cooked on the millionaire Reg Grundy’s yacht! To me the last few chapters were the ones that hooked me in the most. There is a chapter dedicated to his brother Ronnie who is a heroin addict. Gordon Ramsay talks very honestly about how he has continually tried to help, paying for rehab and taking him into his own home, and the guilt he feels when finally he had to take the decision to put his own family first. There is quite a lot of graphic description and I think it was really brave of him to write so openly about such a difficult relationship. There is another chapter entitled ‘Down Among the Women’ where he pays tribute to the women in his life, particularly his mum who has come through such difficult times herself. It is interesting that the book itself is dedicated to her with the rather poignant words – ‘from cottage pie to Humble Pie – you deserve a medal.’ He also talks warmly of his sisters and his wife Tana. Most interesting is his approach to bringing up his children – three girls and a boy. He definitely does not want them to be spoiled – in fact they only have a pound a week pocket money and any extra has to be earned by doing jobs around the house or garden. I applaud this attitude as it would have been all too easy to lavish everything on them running the risk that nothing would be appreciated! There were a couple of things that I learned about Gordon Ramsay in the book that I found particularly interesting. Firstly he was not at the birth of any of his children, something very unusual in this day and age! He openly admits that he could not easily face all the gore and the placenta! But also, his wife was quite happy for him not to be there either, thinking he would be too controlling, and opted for her mum instead! Secondly, he has two kitchens in his house. His wife runs the everyday one particularly where she prepares the children’s meals – and much to his consternation she sometimes had ready meals with Jamie Oliver’s name on! That, he says, really wound him up! The second kitchen is something else though! It cost, would you believe, £500,000 to put in and includes an oven costing £65,000! Quite difficult to imagine what it must look like. It is used for work as well as some home cooking, but still, the sheer scale of that is really something else! I really enjoyed reading ‘Humble Pie‘ and found it quite enlightening about someone who is quite often in the public eye. He does come over as quite humble and never seems to forget where he came from and those who helped him on the way. There is, which probably won’t surprise many, a fair proportion of the F word scattered through the book (and I don’t mean ‘food’) I suppose it is quite unnecessary, but anyone who has seen him on TV will know that is how he speaks, so I didn’t really expect anything else. He is quite open about the TV work and you can tell that ‘Kitchen Nightmares’ is quite important to him and he likes to think that it makes a difference. The experience of ‘Hell’s Kitchen’ is another matter though – one he doesn’t care to remember too often! 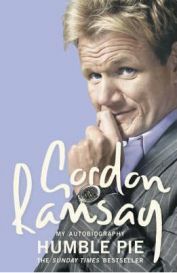 So I definitely enjoyed this book and would recommend it to all Gordon Ramsay fans. It’s interesting though that he has written his biography at the age of forty! I can’t help feeling that there might, sometime in the future, be a sequel. No Comments on "Gordon’s Humble Pie"